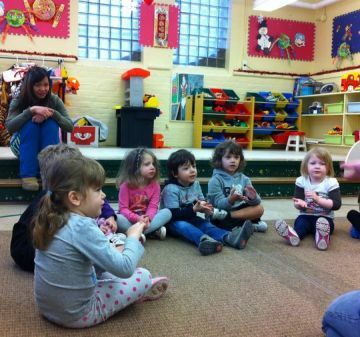 Located in the heart of Toronto’s beautiful Hillcrest Village neighbourhood, the McMurrich Co-operative Playschool (MCPS) has offered young children a wonderful first-time school experience for over 30 years. We are located within the McMurrich Junior Public School, which offers the children an opportunity to witness the larger scale of school life from the security of a small self-contained environment. Licensed through the Day Nurseries Act and regulated by the Ministry of Education, our program allows your child to learn, play and socialize in a caring and compassionate environment. MCPS offers a morning program for children from 2.5 to 4 years old. Our classes are run by two registered Early Childhood Educators (RECE) along with our parent volunteers. Parents and teachers work together to provide a stimulating program of activities in a caring and safe environment. Group participation and play is an important part of our program as it encourages the children to build self-confidence, mutual respect and feelings of fulfillment and acceptance. MCPS was started by a group of neighborhood families interested in providing an opportunity in the community for pre-school children to begin socializing outside the home. We also incorporate field trips as a teaching tool throughout our neighbourhood – the local fire station, Wychwood Barns, and other fun Midtown Toronto & St. Clair West destinations. Our co-op was incorporated in 1984 as a non-profit, parent-teacher run nursery school.